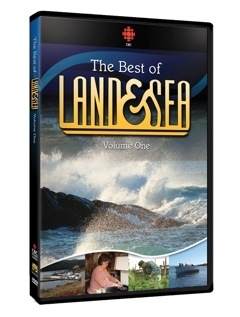 The Best of Land & Sea CBC's "Land & Sea" and Downhome have joined forces to produce this special DVD. Volume One contains three of the most popular episodes in the show's history, plus a bonus episode, for two full viewing hours. It's a well-rounded snapshot of the series, beloved for sharing stories of those who celebrate life close to nature, and who promote and protect their culture and traditional ways of doing things. Celie's Story: Celie Smith is an outdoorswoman unlike any other you've ever met. This 88 year old force of nature sets her own snares, traps her own beaver and kills her own bears. Celie's practically a legend in Hawke's Bay on Newfoundland's Northern Peninsula. This powerhouse of a woman backs down from nothing and works as hard as any man The Heart of Hagan's Hospitality: She's on Youtube. She's been captured in song and cartoon if you met Rita Hogan, you didn't soon forget her. And if you stayed at Rita's Hospitality Home, You definitely didn't go away hungry. But this isn't the story of a business. It's the story of incredible tragedy and incredible strength of human spirit. And perhaps just a little divine intervention. What My Eyes Have Seen: The truly eye opening story of Labrador small boat fisherman Rodney Barney, a commercial fisherman who is legally blind and won't let his disability get in the way of his passion for the sea. Bonus Episode: Fried Squirrels and Beaver Tails: In their cabin in central Newfoundland, there's always a pot on the stove brimming with something delicious and mysterious. Everything from squirrels, to bear soup, to beaver, to bear fat French fires - almost everything Dan Stanford traps ends up on Hazel Tubrett's supper table.